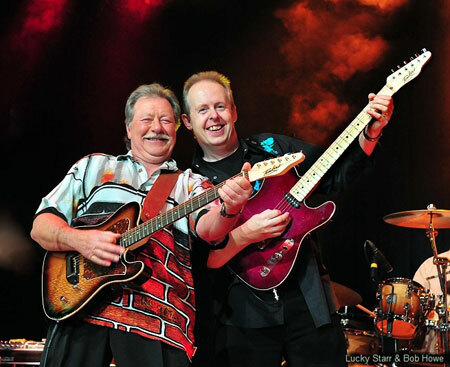 Award-winning guitarist and singer Bob Howe has been part of the Country Music scene for more than 35 years. Musical Director for many International stars, TV shows and recording projects, Bob is also an artist in his own right. As a session musician his credits include playing guitar, harmonica and mandolin on several Golden Guitar winning tracks. Bob also writes the popular Internet column 'Cowboys In Cyberspace' for Capital News and provides a Web design service for artists and companies. Performer, writer, producer, compere, Webmaster...take your pick! Bob's first Tomkins 'Diamondtina II' model has a Hoop Pine body (which has hollow tonal cavities) and a Stringy Bark top. 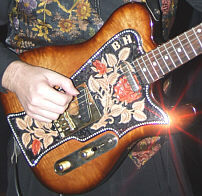 The pickguard is hand-carved leather with a touch of Showbiz - inlaid edging of diamante! Bob also plays guitar with HILLBILLY HEAVEN and a Tomkins bass with the award-winning band THE TROJANS! 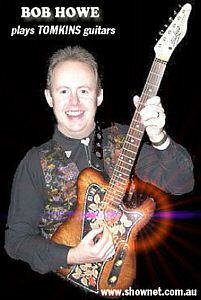 In 2009, Bob commissioned Allan to make a new Tomkins 'Diamondtina II' model guitar for him. 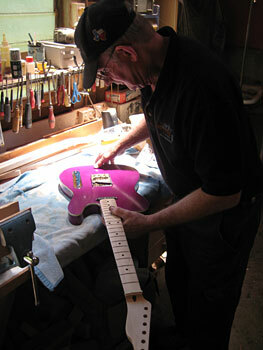 Pictured right, Allan puts the finishing touches to Bob's guitar in time for the Tamworth Festival. A body of Australian Red Cedar with stripped binding and Sparkle Purple gloss nitrocellulose laquer. A Wilkinson Tilt Bridge, Tomkins Custom Pickups by Nordstrand and a hard rock maple neck with Sperzel Tuners. Pictured below, later that year, Australian-music legend Lucky Starr onstage with Bob at the Canterbury Country 9th Birthday show in Sydney.